Andy fell ill… it was a case of seasickness. No not really… I had symptoms of a cold, it just got worse after watching it. Pirates of the Caribbean: At World’s End is the third and last of the money spinning trilogy, or so they say. Everything has led to this, or so they say again and I kept my mind opened. The first of the Pirates series, The Curse of the Black Pearl was good. It was a movie out of nothing or more correctly a movie inspired by nothing more than a Disney theme park ride. Having said that however the creation of Captain Jack Sparrow was nothing short of inspirational. Captain Jack played by the charismatic Johnny Depp became the talisman of Pirates of the Caribbean. Thought to be dead when we saw him charging into the jaws of monster octopus Kraken toward the end of Dead Man’s Chest (the sequel), he is to be brought back from the dead in this latest film. I have to be honest; I hated Dead Man’s Chest. Its various plots and subplots were terribly tangled and confusing. It was hard to follow what sort of story or motives the movie wants to say. I blamed my lack of understanding for not comprehending Dead Man’s Chest. That was summer of last year but since then I have done my research, for the billion dollars making movie was to have a third installment. Having seen one and two, I have to see three. But if I do not understand two then how can I go ahead with three. And so after a better understanding of two I saw three. For all my efforts I was still robbed by the pirates. I was led happily out into the open sea before being robbed. I was enjoying the first third of the 168 minutes film. Captain Jack’s crew arrived in Singapore to look for Captain Sao Feng (Chow Yun-Fatt), pirate lord of the South China Sea for a ship and a map, so they could sail to world’s end and rescue our favourite captain from Davy Jones’s Locker. Davy Jones’s Locker is a ghost realm of the netherworld where the dead Captain Jack Sparrow is being kept for eternity. There appears to be some oriental influence in At World’s End. Firstly of course we are introduced to a Chinese pirate, Captain Sao Feng. Secondly, the costumes and all were very well designed in an exquisite oriental fashion. And there was Singapore, a South East Asian country where Captain Sao Feng can be found. What is it you say? You didn’t know? And I’m absolutely furious at the Singapore set. Singapore is nowhere near what it looks like in the movie. I’m kidding. I’m not at all angry about it. The Singapore set was designed in perspective of how it would look like in the era of the pirates. Credit to the designers for a good piece of creation. What you see on screen is not at all like what modern Singapore is now, which is a multi-cultured nation. And Chow Yun-Fatt is from Hong Kong. The Singapore set features a bathhouse and I couldn’t help relating it to Japanese animation master Hayao Miyazaki’s Spirited Away. The popular animated film, released by Disney in the west has a bathhouse theme. The relation did not stop there, and I wondered if the scene where Captain Jack Sparrow is isolated in Davy Jones’s Locker was inspired too by Hayao Miyazaki’s work. The part where thousands of strange and curious yet harmless rounded stone-like crab helping Jack move his ship, The Black Pearl across a desert aroused my attention to this perspective. It was through the hands, eyes and imagination of the acclaimed animation master, Hayao Miyazaki that made famous the approach of detailing stories with thousands of mini little intriguing creatures. And it was fun to watch. 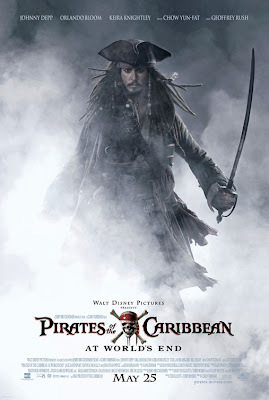 I was enjoying At World’s End, laughing merrily at all the pirate jokes that the characters are lashing out at one another, feeling the thrill of the sword-fights and of course attracted to the sometimes witty, looney and mad character of Captain Jack Sparrow. That scene of him engaging himself to his many different personalities while alone in the deserted Davy Jones’s Locker is a real gem. But with all the oriental influences, the filmmakers probably did not take note of the teachings of Zen, where less is truly more. For when after the crew rescued Captain Jack Sparrow and brought him back to the mortal world, it all happened again. The tangling and confusing plots and subplots manifested once more and killed whatever is good about the film. In my opinion, if At World’s End had ended after rescuing Captain Jack and had a straight approach in the gathering of forces to deal with Lord Cutler Beckett (Tom Hollander) and Davy Jones (Bill Nighy) with a fitting spectacle of a finale fight, the film would have been great. I was trying to understand the story. In reflection I probably should not for it amounted to nothing. It would be tiring for me just to list them all out. So just be warned that in the film, every character have their own personal agenda. It is “me” first and “you” later if “you” are still there. If that is the purpose of the story-writers to represent the meaning of how pirates are, then they have succeeded. In fact it was so successful that they lost me. It bored me so much I no longer laughed at the jokes. It dragged on so long I no longer felt compelled to see the ending. I just want the film to end there and then. Thanks a billion, filmmakers, or is it thanks me instead? This entire Pirate series is like a ride on a pirate ship in a theme park, it was thrilling for a start but as it swing back and forth too many times the nauseas will come and when it stops you find yourself displaced nowhere. Pirates of the Caribbean: At World’s End is a fine example of a good film gone bad because it had too many tangling tales to tell. I maintain that it is worth watching for the first third of the film but save yourself from seasickness in the middle just so you can enjoy the spectacular fight sequence toward the end.